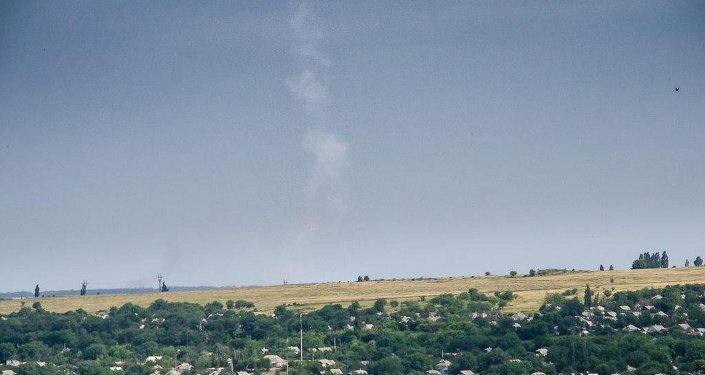 Dutch blogger Max van der Werff explained to Sputnik why he decided to carry out his own investigation into the origin of two controversial photos which circulated on social networks shortly after the MH17 crash, purporting to show a trail of smoke in the sky from a missile launcher, and what his inquiry uncovered. Unlike the majority of people who have either accepted or rejected the authenticity of the two photos that were published online, Dutch blogger Max van der Werff made it all the way to Donbass to see for himself where the photos were allegedly taken. “Reading "The Grand Chessboard" by Brzezinski it becomes clear why, for the USA, Ukraine is important as a geological hotspot to contain Russia,” he told Sputnik. “On July 17, a few hours after the MH17 crash, it was clear to me this tragedy would be abused and milked over and over again to demonize Russia and its president in particular,” he added. Max van der Werff explained that he is Dutch citizen and in a single day his country lost almost 200 people in the crash. MH17 would have never been shot down if there was no civil war in Ukraine. “Fifteen years ago, August 1999, I traveled for the first time to Ukraine. Just after the NATO bombing of the former Yugoslavia by NATO. My analysis was that Ukraine would become one of the next areas of confrontation,” he added. The blogger went all the way to Donbass, took footage of the roof from which the anonymous photographer claimed to have taken the picture, and then proved the image is fraudulent, since the view from the roof does not match that of the photo. Van der Werff's conclusions also correspond with other doubts over the veracity of the photos, raised because the relatively clear weather conditions shown on the photo do not match those reported on the day of the crash, when the sky was overcast. The blogger spoke to people who know the supposed photographer and says their reaction is not that of anger but rather regret that he had chosen to support the new regime in Kiev. Van der Werff also explained that it is almost impossible for a Western journalist to not report in line with the anti-Russian sentiment. The mantra is "nothing-against-Russian-but-against-dictator-Putin. "If you have a different view, you're weeded out by the gatekeepers. He rather advised to follow Karel van Wolferen, a Dutch journalist, writer and professor. “In much of the European Union the general understanding of global reality since the horrible fate of the people on board the Malaysian Airliner comes from mainstream newspapers and TV which have copied the approach of Anglo-American mainstream media, and have presented ‘news’ in which insinuation and vilification substitute for proper reporting,” Van Wolferen wrote in one of his articles. Mr van der Werff concluded by summarizing how Western media works, "So, it is not a conspiracy. It is just how peer pressure works."